This product is new, unopened, and expired. It can be used for practice or re-sterilized for professional use. This item has been discounted and is a final sale. These plastic tattoo tubes by Precision Supplies are ideal for artists who prefer the convenience of disposable tools. The tubes are made of hard plastic with an ergonomic finger contour. 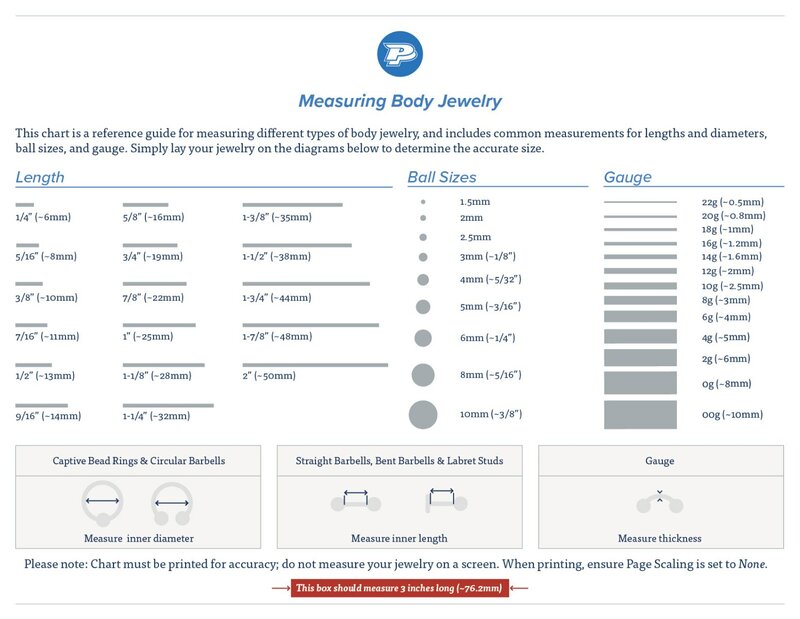 They measure 4” in length with a 7.8mm diameter and are equipped with a 3/4” or 1" plastic grip for additional ergonomic stability during procedures. This listing is for one box of 25 disposable Classic (Black), Vision (Clear), or White tattoo tubes with Flat, Round, or Diamond tip styles. Please Note: This listing is for one box of 25 grip & tub sets that are expired. These grip/tube sets are new and unopened, but can be used for practice or they must be re-sterilized for professional use. This item has been discounted and is a final sale. https://www.painfulpleasures.com/closeout-classic-vision-and-white-tattoo-and-grip-sets-3-4-and-1-price-per-box.html?___store=1 48449 Closeout Classic, Vision, and White Tube & Grip Sets — 3/4" and 1" — Price Per Box https://cdnstoremedia.painfulpleasures.com/media/catalog/product/c/l/closeout_tubes_3.jpg 4.00 5.99 USD InStock /Tattoo Supplies /Tattoo Supplies/Disposable Tattoo Tubes /Tattoo Supplies/Tattoo Grips & Accessories /Tattoo Supplies/Tattoo Grips & Accessories/Disposable Grips /Sales/Under $5 /Sales/Under $10 /Sales/Under $15 /Sales/Tattoo Supplies /Sales/Under $20 /Tattoo Supplies/Tattoo Supplies - View All This product is new, unopened, and expired. It can be used for practice or re-sterilized for professional use. This item has been discounted and is a final sale. Closeout Hard Plastic Disposable Tubes — Classic, Vision, or White with 3/4” or 1" Grip Included — All Tip Styles and Sizes These plastic tattoo tubes by Precision Supplies are ideal for artists who prefer the convenience of disposable tools. The tubes are made of hard plastic with an ergonomic finger contour. They measure 4” in length with a 7.8mm diameter and are equipped with a 3/4” or 1" plastic grip for additional ergonomic stability during procedures. 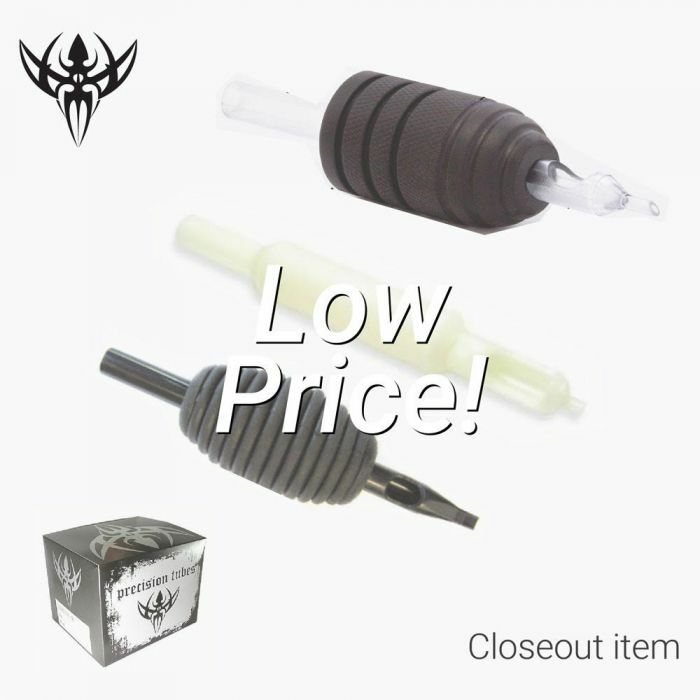 This listing is for one box of 25 disposable Classic (Black), Vision (Clear), or White tattoo tubes with Flat, Round, or Diamond tip styles. Please Note: This listing is for one box of 25 grip & tub sets that are expired. These grip/tube sets are new and unopened, but can be used for practice or they must be re-sterilized for professional use. This item has been discounted and is a final sale. Specifications: Material: Hard Plastic Length: 4” (~100mm) Tube Diameter: 7.8mm 3/4” or 1" Grip included Available in Classic, Vision, or White Available in a variety of tip styles Sterilized with date stamped marking Price per one box of 25 tubes/tips USD 48450 Closeout Classic, Vision, and White Tube & Grip Sets — Price Per Box of 25 - Black - FT5-1" 4 5.99 https://cdnstoremedia.painfulpleasures.com/media/catalog/product/c/l/closeout_tubes_3.jpg InStock Black FT5-1" 48453 Closeout Classic, Vision, and White Tube & Grip Sets — Price Per Box of 25 - Black - RT11 - 3/4" 4 5.99 https://cdnstoremedia.painfulpleasures.com/media/catalog/product/c/l/closeout_tubes_3.jpg InStock Black RT11-3/4" 48456 Closeout Classic, Vision, and White Tube & Grip Sets — Price Per Box of 25 - Black - RT18 - 3/4" 4 5.99 https://cdnstoremedia.painfulpleasures.com/media/catalog/product/c/l/closeout_tubes_3.jpg InStock Black RT18-3/4" 48458 Closeout Classic, Vision, and White Tube & Grip Sets — Price Per Box of 25 - Black - VT11 - 3/4" 4 5.99 https://cdnstoremedia.painfulpleasures.com/media/catalog/product/c/l/closeout_tubes_3.jpg InStock Black VT11-3/4" 48459 Closeout Classic, Vision, and White Tube & Grip Sets — Price Per Box of 25 - Black - VT14 - 3/4" 4 5.99 https://cdnstoremedia.painfulpleasures.com/media/catalog/product/c/l/closeout_tubes_3.jpg InStock Black VT14-3/4" 48460 Closeout Classic, Vision, and White Tube & Grip Sets — Price Per Box of 25 - Black - VT18 - 1" 4 5.99 https://cdnstoremedia.painfulpleasures.com/media/catalog/product/c/l/closeout_tubes_3.jpg InStock Black VT18-1" 48461 Closeout Classic, Vision, and White Tube & Grip Sets — Price Per Box of 25 - Black - VT18 - 3/4" 4 5.99 https://cdnstoremedia.painfulpleasures.com/media/catalog/product/c/l/closeout_tubes_3.jpg InStock Black VT18-3/4" 48463 Closeout Classic, Vision, and White Tube & Grip Sets — Price Per Box of 25 - Black - VT3 - 3/4" 4 5.99 https://cdnstoremedia.painfulpleasures.com/media/catalog/product/c/l/closeout_tubes_3.jpg InStock Black VT3-3/4" 48465 Closeout Classic, Vision, and White Tube & Grip Sets — Price Per Box of 25 - Clear - FT15 - 1" 4 5.99 https://cdnstoremedia.painfulpleasures.com/media/catalog/product/c/l/closeout_tubes_3.jpg OutOfStock Clear FT15-1" 48466 Closeout Classic, Vision, and White Tube & Grip Sets — Price Per Box of 25 - Clear - FT5 - 1" 4 5.99 https://cdnstoremedia.painfulpleasures.com/media/catalog/product/c/l/closeout_tubes_3.jpg InStock Clear FT5-1" 48468 Closeout Classic, Vision, and White Tube & Grip Sets — Price Per Box of 25 - Clear - RT18 - 1" 4 5.99 https://cdnstoremedia.painfulpleasures.com/media/catalog/product/c/l/closeout_tubes_3.jpg InStock Clear RT18-1" 48469 Closeout Classic, Vision, and White Tube & Grip Sets — Price Per Box of 25 - Clear - VT11 - 1" 4 5.99 https://cdnstoremedia.painfulpleasures.com/media/catalog/product/c/l/closeout_tubes_3.jpg InStock Clear VT11-1" 48471 Closeout Classic, Vision, and White Tube & Grip Sets — Price Per Box of 25 - White - FT11 - 3/4" 4 5.99 https://cdnstoremedia.painfulpleasures.com/media/catalog/product/c/l/closeout_tubes_3.jpg InStock White FT11-3/4" 48473 Closeout Classic, Vision, and White Tube & Grip Sets — Price Per Box of 25 - White - FT5 - 3/4" 4 5.99 https://cdnstoremedia.painfulpleasures.com/media/catalog/product/c/l/closeout_tubes_3.jpg InStock White FT5-3/4" 48476 Closeout Classic, Vision, and White Tube & Grip Sets — Price Per Box of 25 - White - RT11 - 3/4" 4 5.99 https://cdnstoremedia.painfulpleasures.com/media/catalog/product/c/l/closeout_tubes_3.jpg InStock White RT11-3/4" 48478 Closeout Classic, Vision, and White Tube & Grip Sets — Price Per Box of 25 - White - VT14 - 3/4" 4 5.99 https://cdnstoremedia.painfulpleasures.com/media/catalog/product/c/l/closeout_tubes_3.jpg InStock White VT14-3/4" 48479 Closeout Classic, Vision, and White Tube & Grip Sets — Price Per Box of 25 - White - VT18 - 3/4" 4 5.99 https://cdnstoremedia.painfulpleasures.com/media/catalog/product/c/l/closeout_tubes_3.jpg InStock White VT18-3/4" 48451 Closeout Classic, Vision, and White Tube & Grip Sets — Price Per Box of 25 - Black - FT5 - 3/4" 4 5.99 https://cdnstoremedia.painfulpleasures.com/media/catalog/product/c/l/closeout_tubes_3.jpg InStock Black FT5-3/4" 48452 Closeout Classic, Vision, and White Tube & Grip Sets — Price Per Box of 25 - Black - RT11 - 1" 4 5.99 https://cdnstoremedia.painfulpleasures.com/media/catalog/product/c/l/closeout_tubes_3.jpg InStock Black RT11-1" 48454 Closeout Classic, Vision, and White Tube & Grip Sets — Price Per Box of 25 - Black - RT14 - 1" 4 5.99 https://cdnstoremedia.painfulpleasures.com/media/catalog/product/c/l/closeout_tubes_3.jpg OutOfStock Black RT14-1" 48462 Closeout Classic, Vision, and White Tube & Grip Sets — Price Per Box of 25 - Black - VT3 - 1" 4 5.99 https://cdnstoremedia.painfulpleasures.com/media/catalog/product/c/l/closeout_tubes_3.jpg InStock Black VT3-1" 48467 Closeout Classic, Vision, and White Tube & Grip Sets — Price Per Box of 25 - Clear - RT11 - 1" 4 5.99 https://cdnstoremedia.painfulpleasures.com/media/catalog/product/c/l/closeout_tubes_3.jpg InStock Clear RT11-1" 48477 Closeout Classic, Vision, and White Tube & Grip Sets — Price Per Box of 25 - White - VT11 - 3/4" 4 5.99 https://cdnstoremedia.painfulpleasures.com/media/catalog/product/c/l/closeout_tubes_3.jpg InStock White VT11-3/4" 48455 Closeout Classic, Vision, and White Tube & Grip Sets — Price Per Box of 25 - Black - RT18 - 1" 4 5.99 https://cdnstoremedia.painfulpleasures.com/media/catalog/product/c/l/closeout_tubes_3.jpg InStock Black RT18-1" 48480 Closeout Classic, Vision, and White Tube & Grip Sets — Price Per Box of 25 - Black - VT11 - 1" 4 5.99 https://cdnstoremedia.painfulpleasures.com/media/catalog/product/c/l/closeout_tubes_3.jpg InStock Black VT11-1" 48481 Closeout Classic, Vision, and White Tube & Grip Sets — Price Per Box of 25 - Clear - RT14 - 1" 4 5.99 https://cdnstoremedia.painfulpleasures.com/media/catalog/product/c/l/closeout_tubes_3.jpg InStock Clear RT14-1" 50728 Closeout Classic, Vision, and White Tube & Grip Sets — Price Per Box of 25 - Black - FT13-3/4" 4 5.99 InStock Black FT13-3/4" 50729 Closeout Classic, Vision, and White Tube & Grip Sets — Price Per Box of 25 - Black - FT7-3/4" 4 5.99 OutOfStock Black FT7-3/4" 50730 Closeout Classic, Vision, and White Tube & Grip Sets — Price Per Box of 25 - Black - RT14-3/4" 4 5.99 InStock Black RT14-3/4" 50731 Closeout Classic, Vision, and White Tube & Grip Sets — Price Per Box of 25 - Black - VT9-3/4" 4 5.99 InStock Black VT9-3/4"